Oak woodcarving in the choirstall area of the Cathedral of Amiens, 1507-1522. 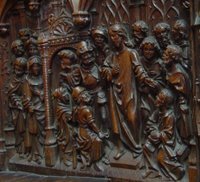 This scene shows Jesus teaching his disciples, while the crowd outside listens attentively. The beauty of the oak woodcarvings that adorn the otherwise simple seating for clerics is world renowned. Jesus Teaching the Disciples, from Art in the Christian Tradition, a project of the Vanderbilt Divinity Library, Nashville, TN. http://diglib.library.vanderbilt.edu/act-imagelink.pl?RC=51542 [retrieved April 23, 2019]. Original source: Collection of Anne Richardson Womack.